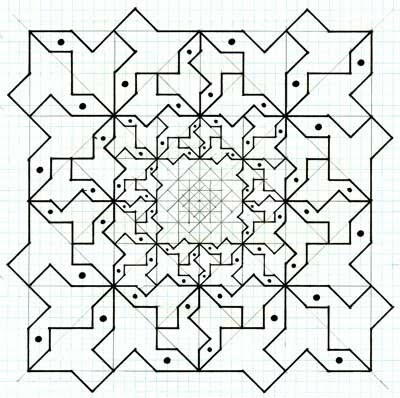 A different type of tiling to ‘normal' tessellations of congruent tiles is that of self-similar tiles. These refer to tiles that reduce in size in a 'proportionate' manner in a tiling. Simply stated, examples of this type can be considered as capturing the principle of infinity in a print, this being in contrast to a normal tessellation, where the principle of infinity (i.e. 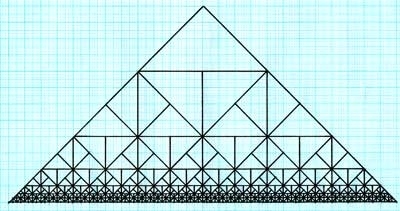 the continuation of the tessellation) is implied. Escher used this device in a number of his prints of contrasting complexities, with very basic mathematics involved (of his own devising), such as Square Limit and Smaller and Smaller I, and more complex examples involving hyperbolic geometry (devised by other people), such as the Circle Limit series. As such, the understanding of hyperbolic geometry is outside my understanding, and so this study thus concentrates on the simpler Square Limit type examples. Pleasingly, the process involved is extremely simple, it involving elementary mathematics, and so is therefore accessible to everyone. Escher (for once) clearly gave a ‘how to' guide in Regalmatige vlakverderling (reproduced in Escher The Complete Graphic Work, pages 168-169). Once the 'division process' is understood, this can be applied to other configurations, and not just of the basic square division. Furthermore, the process can be inverted, a development from ‘outside to in', and to ‘in to outside'. Just as the tiles can be made to reduce, so can motifs also, as shown by the examples below. However, the introduction of motifs involves further complexities. For example, with the Square Limit, based on a series of right-angled triangles, it may be thought sufficient that a arbitrary life-like tiling based of that specific tile would automatically be suitable. However, in practice this will be found to be not so. Indeed, the type of motif is critical, as some are more suitable than others are. As such, due to the distortions required, the motif has to have a certain degree of flexibility in its outline, which renders motifs with a distinct outline unsuitable. 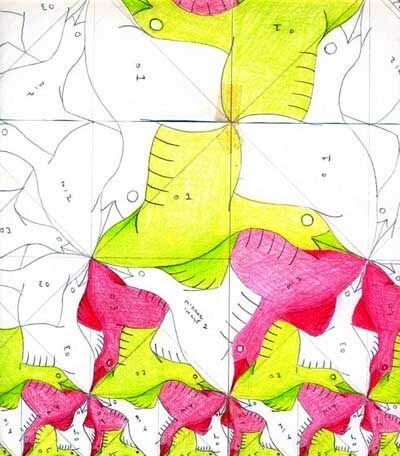 As with ‘normal' tessellations, the most flexible motifs in these matters are birds and fish, and these are ideal motifs (observe that Escher used a fish motif, albeit this was somewhat fanciful in its veracity). However, even this has to be qualified, as instances can occur where even these highly flexible (in terms of outline) motifs prove unsuitable. In contrast, motifs with specific, unambiguous distinct outlines, such as dogs, the distortion involved for creatures of this type is too great to be considered as acceptable in terms of quality. From this, other configurations can be composed, either derived directly from this, or of one's own configuration, of which the only limit is one's imagination. Some representational samples are shown below. 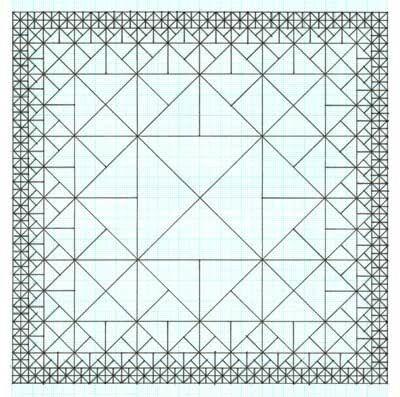 To these grids can be added lifelike motifs. 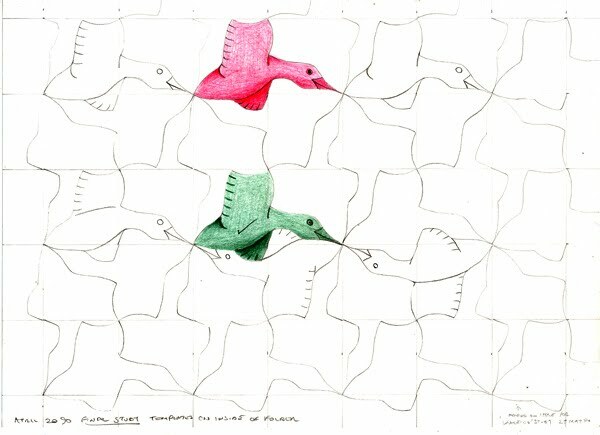 To establish the principle, I show a variety of geometric bird-like self-similar examples, where the tile is indeed truly self-similar. (The introduction of 'freeform lines' as in a real-life bird causes distortions leading to tiles that are not strictly self-similar.) Rather than giving a detailed series of instructions, as the diagrams are self explanatory, these are not discussed. The example below, Figure 6, shows the addition of bird motifs (based upon the plane tiling of Figure 9) to the square limit grid of Figure1. The birds are most realistic, albeit as stated in the introduction, necessarily distorted. For example, compare tiles ‘Green 1' with ‘Green 3' (see detail of Figure 7). Although these are both nominally of a similar right-angled triangle, the birds themselves can be seen to be not exactly self-similar as a wireframe right-angled grid example would be. However, this aspect is unavoidable for life-like motifs. (This may be thought down to my own ‘lack of ability', but this is misleading. A scrutiny of Escher's Square Limit reveals like distortions that simply have to be accepted.) To a degree, this ‘shortcoming' is masked, as to a casual glance the motifs are self similar, albeit under closer scrutiny this is detectable. 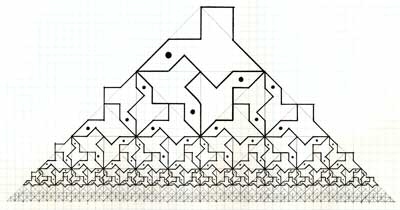 Of note here is the design of the bird motif outline, which is derived indirectly from Escher's own fish motif outline. 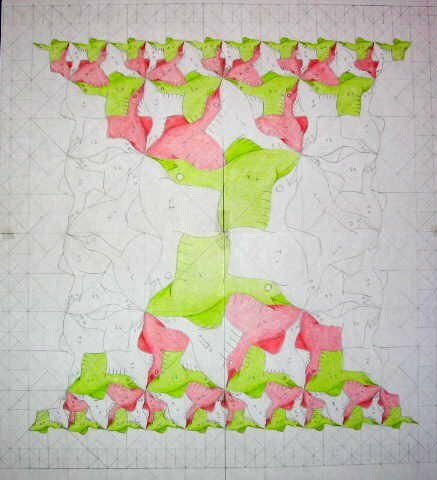 Essentially, what I have done here is to take Escher's tile, made a very slight adjustment to the outline (that has no bearing on the argument below), and used this for an entirely different motif, of a bird. 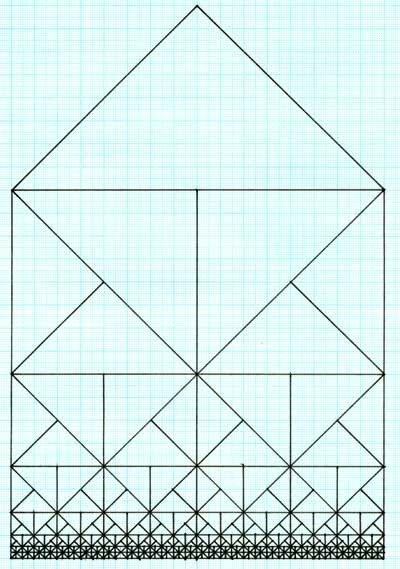 Indeed, this could retrospectively be applied to Escher's own composition itself, and is arguably superior, in that the bird motif is clearly superior to Escher's ‘fish', which in reality is highly contrived – no fish has ‘fins' or a tail like this. Again, as discussed elsewhere (Essay 12, The Silhouette Test) gives evidence to this.